The European Parliament's international trade committee has rejected a proposal by David Martin, an MEP who is drafting the Parliament's position on ACTA. Martin wanted to ask the European Court of Justice for its opinion on the controversial anti-piracy treaty, but the committee decided yesterday that wasn't needed and will now vote in June on whether to approve ACTA. Opponents of the treaty see the development as a victory. The plan was to ask the ECJ to look at ACTA and decide if it conflicts with the EU’s fundamental rights and freedoms, including freedom of expression and right to privacy. Separately, David Martin, a UK MEP who is drafting the Parliament’s position on ACTA, made a proposal to put ACTA before the European Court of Justice to get its opinion, but the committee decided yesterday that wasn’t needed and will now vote in June on whether to approve ACTA. The European Parliament’s trade committee rejected the plan with 21 MEPs voting against, 5 in favor and 2 abstentions. 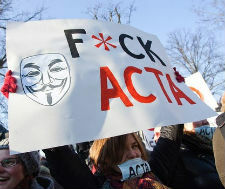 This means that ACTA could now be put before Parliament in a matter of months. Had ACTA been immediately referred to Europe’s highest court, it would have meant a delay of one, maybe two years. “Referring ACTA to the court is no substitute for the political procedure needed to check this agreement and determine democratically whether its entry into force is in the European interest,” said Pirate Party MEP and Shadow rapporteur on ACTA for the GreensAmelia Andersdotter. “Only a democratic ratification process via the European and national parliaments is able to provide such a judgment, and we therefore welcome today’s decision to continue with this process,” she concluded. After its existence was first discovered by the public in 2008 after documents were uploaded to Wikileaks, ACTA’s opponents now have just 10 weeks to pull out the stops.